Democrats and Republicans believe the Kavanaugh fight galvanized midterm voters. The bitterly divisive confirmation battle over Brett Kavanaugh may have ended this past weekend, but both Democrats and Republicans are eager to use the political fallout from the episode as a way to stoke the passions of voters with less than one month before a midterm election in which control of both the U.S. House and Senate hangs in the balance. Senate Majority Leader Mitch McConnell, who shepherded Kavanaugh through an at times skittish Republican caucus, said Monday that the battle has given the party an additional motivational tool to turn out the base in states that are key to hopes of retaining their slim majority. "It provided the adrenalin shot that we had not been able to achieve in any other way," McConnell told reporters at a press conference in Louisville. House Speaker Paul Ryan offered a similar assessment of the post-Kavanaugh political landscape. "I can just see it just from traveling around the country in the last few days, traveling around Wisconsin, the Republican base is definitely animated after this," Ryan said at an event in Washington, D.C.
(Getty Images) Brett Kavanaugh speaks at the Senate Judiciary Committee hearing on Capitol Hill in Washington, Sept. 27, 2018. Those assertions were echoed over the weekend by a jubilant President Donald Trump, who celebrated Kavanaugh's confirmation at a campaign rally in Topeka, Kansas, framing the midterm elections as a "chance to stop the radical Democrats” and respond to their "disgraceful campaign" to "delay, demolish and destroy" his second pick to serve on the nation's highest court. "Each of you in four weeks will have your chance to render your verdict on the Democrats’ conduct at the ballot box," Trump told the crowd in Kansas, where Democrats are eyeing two congressional seat and have an outside shot at flipping the governor's mansion blue, in large part due to the Republican's nomination of controversial Kansas Secretary of State Kris Kobach, who defeated the state's sitting governor in a primary over the summer. 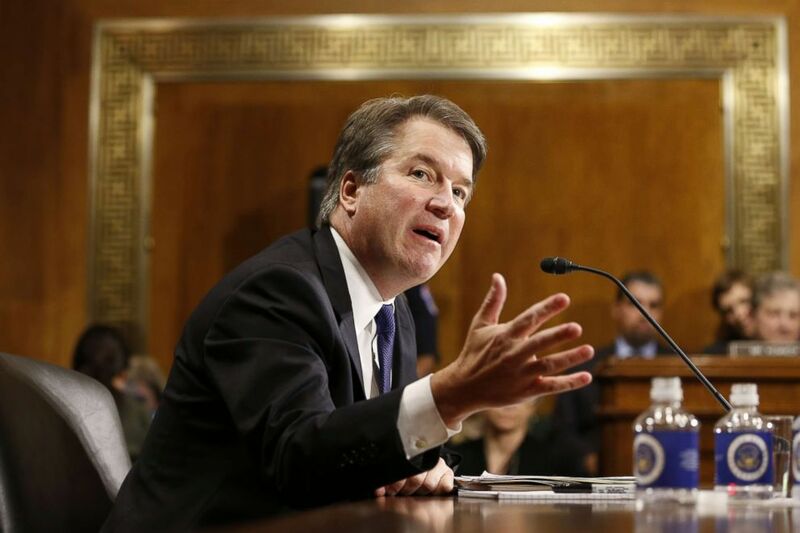 But despite McConnell and Trump's excitement, the political effect of the Kavanaugh fight is likely to fall unevenly and unequally across an already chaotic midterm landscape. 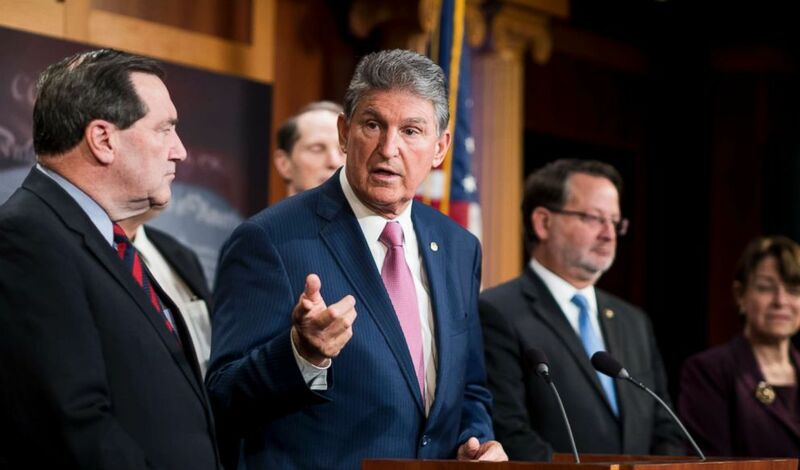 That is evident for those in tough re-election fights like West Virginia Sen. Joe Manchin, who has face a firestorm back home for breaking with his party and supporting Kavanaugh despite the allegations against the nominee. Officials from both parties have cited an uptick in fundraising during the political fight over Kavanaugh's nomination. Matt Gorman, the communications director of the National Republican Campaign Committee (NRCC) told ABC News that they have experienced a more than 400 percent increase in money raised in the first week of October compared to the first week of September, and saw marked increases in individual donors and the average donation to the group as well. An official from the Democratic National Committee (DNC) told ABC News that the group saw a 167 percent increase in donations in the first week of October compared to the first week of September, adding that the group raised $1.5 million online in the 72 hours after the Senate Judiciary Committee held hearings that featured both Kavanaugh and his accuser, Christine Blasey Ford, one of the best 72-hour stretches for the group, according to the official. (Bill Clark/CQ Roll Call/Getty Images) Sen. Joe Manchin participates in the Senate Democrats news conference on tax reform in the Capitol, Nov. 28, 2017. Republicans benefit from an election cycle where ten Democrats are defending Senate seats that Donald Trump won in 2016, political territory where the Kavanaugh fight could have awakened a disillusioned base and could stir some voters on the margins to the ballot box in races that could be decided by razor-thin margins. Democrats, however, are largely focused on the fight to re-take the House, which runs through a large and varied swath of battleground congressional districts that are home to suburban, well-educated voters turned off by the partisan rancor that defined Kavanaugh's confirmation process, and has seen female candidates run for office at levels not seen before in American history. "Republicans will use the Kavanaugh issue in red states featuring Senate contests with Democratic incumbents, and Democrats will use Kavanaugh in purple swing suburban districts, especially the ones where they have women nominees," Larry Sabato, the director of the University of Virginia Center for Politics, told ABC News. Top Democratic candidates and figures across the country, in deep blue and swing states alike, have urged supporters to channel the frustration and passion over the Kavanaugh fight into action, and more importantly votes. "We can't stop fighting. Progress doesn't happen overnight. It can be painful. It can be slow. But now is the time to roll up our sleeves, knock on doors, and register people to vote. In one month we have the chance to vote and stand up for the country we love," California Sen. Kamala Harris, who paid a visit to Ohio this weekend to campaign for Democrats in the swing state, tweeted following Kavanaugh's swearing-in on Saturday. "This is a tough loss," Wisconsin Senator Tammy Baldwin, herself facing a competitive re-election fight in a state Donald Trump won narrowly in 2016, wrote in a fundraising e-mail Saturday, "The only word of comfort I have for you is this: the fight continues. The Senate may have voted today, but the people vote in 31 days." Kara Eastman, a social worker running as a Democrat in a Nebraska congressional district centered in Omaha that narrowly voted for Trump in 2016, said over the weekend that the Kavanaugh hearings are "emblematic of a culture that degrades women." "The disregard of Dr. Ford’s powerful testimony and other reports of abuse is emblematic of a culture that degrades women, claims control over their bodies, and re-victimizes sexual assault victims. Our country must do better, and be better," Eastman wrote. Meanwhile, Republicans have wasted little time in states like Missouri and North Dakota, two red states that offer enticing opportunities for the GOP to flip Senate seats this cycle, in casting the decision by the states' two female Democratic incumbent Senators to oppose Kavanaugh's nomination as evidence that they are nothing but lackeys of Senate Democratic leadership. Missouri Attorney General Josh Hawley, who is challenging Democratic Sen. Claire McCaskill, warned Monday of Democratic attempts to impeach Kavanaugh if they emerge victorious in November, something House Minority Leader Nancy Pelosi said would "not be [her] plan," if she becomes the next Speaker of the House. 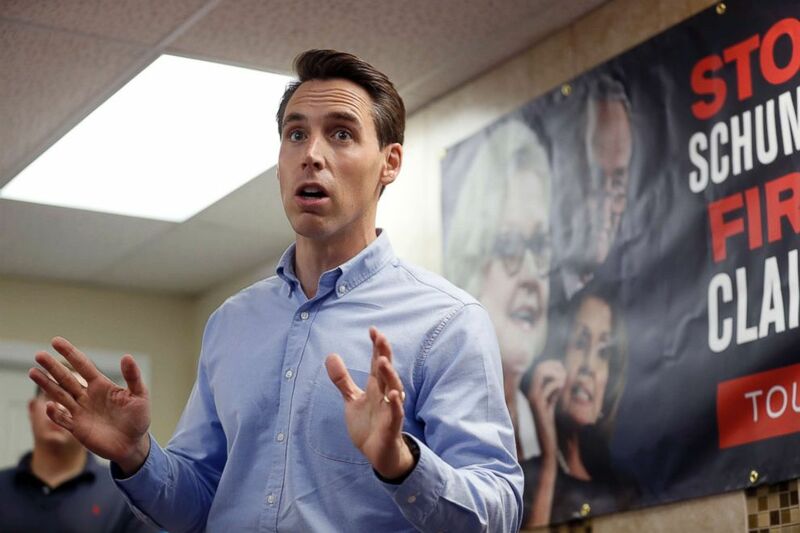 "The Democrat Party wants to undo everything we voted for in 2016," Hawley wrote in a statement released Monday, "Claire McCaskill has proven herself a partisan ally and reliable supporter of Chuck Schumer and the Democrats in Congress. She votes with Chuck Schumer almost 90 percent of the time. She has been a straight party line vote on every single Supreme Court Justice." Pelosi did, however, announce on Sunday that she will file a Freedom of Information Act (FOIA) request "so that the public can see the FBI report," that took place last week and looked into Dr. Ford's allegations against Kavanaugh, and also offered a rallying cry ahead of the midterms. "We must not agonize, we must organize. People must vote. What is at stake in this election is nothing less than the health and financial security of families across America," Pelosi wrote in a statement. McCaskill announced her opposition to Kavanaugh on September 19th, just days after Dr. Ford's name was made public in news reports, and said her decision was "not based on allegations but rather on his positions on several key issues, most importantly the avalanche of dark, anonymous money that is crushing our democracy." In North Dakota, Republicans in the state have seized on Heitkamp's vote against Kavanaugh in the hopes of boosting Rep. Kevin Cramer, saying the Senator "betrayed North Dakotans," by voting against Kavanaugh. Heitkamp has defended her vote against Kavanaugh in deeply personal terms, emphasizing her work as North Dakota Attorney General and recounting her late mother's experience as a sexual assault victim. (Bill Clark/CQ Roll Call/Getty Images) Sen. Heidi Heitkamp speaks during the Senate Democrats news conference on tax reform in the Capitol, Nov. 28, 2017. 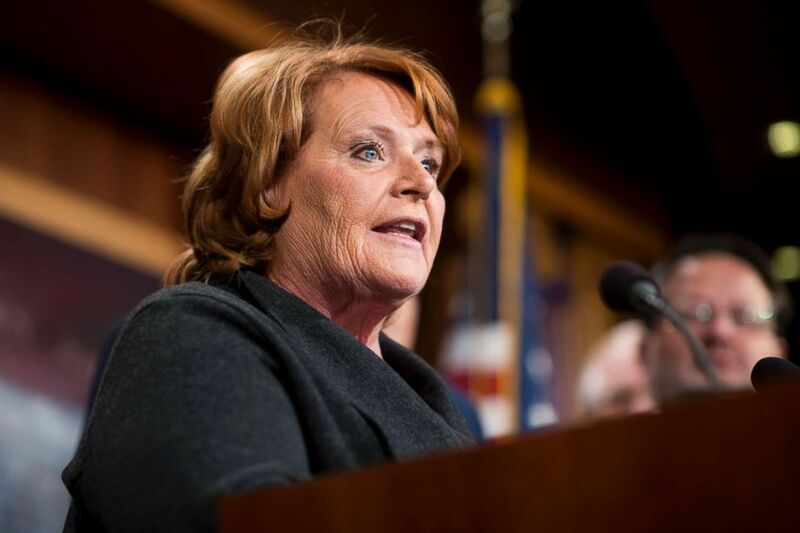 "When I served as North Dakota’s Attorney General, I helped implement the original Violence Against Women Act and I saw how it helped survivors and victims across my state," Heitkamp wrote in a statement last week announcing her opposition to Kavanaugh's confirmation, "My lifetime of work, advocacy, and commitment to these issues, and to these women and girls, helped inform my decision today." Cramer has also taken criticism for his comments during the Kavanaugh fight when he questioned whether the accusations, even if they proved true, should "disqualify" Kavanaugh. Following her no vote on Kavanaugh, Sen. Heitkamp told ABC News that they have had 500 new volunteers sign up to help with her campaign, a further sign that the political effect on the race is still unclear with less than a month until Election Day. In a fundraising e-mail to supporters, Heitkamp's colleague Sen. Patty Murray of Washington State said the vote epitomizes her political independence, an important commodity for a Democrat running a state Donald Trump won by more than 30 points in the 2016 election. "Heidi Heitkamp took a courageous stand against Judge Kavanaugh’s confirmation and is now facing a tough re-election battle next month in North Dakota," Murray wrote, "She did what she knew was right and didn’t worry about the political consequences or the attacks that would come her way, which is something we see far too infrequently in politics these days." While both parties now turn their attention to the final campaign sprint, there is a possibility that the Kavanaugh fight could also fade in the minds of voters. "It’s impossible to say which party’s emotions will endure to election day. Maybe both will. Maybe neither will," Sabato added, "After all, a month in the Trump presidency is worth six months of an earlier administration. So much news comes at us, so fast."